In Three Homes, a memoir published in 1938, playwright and author Lennox Robinson, together with his siblings Tom and Nora, recalled their childhood in late 19th century County Cork. Robinson was born in Douglas, now a dormitory suburb of Cork city but then still a separate village lying a few miles to the south-east. The youngest child of a stockbroker-turned-clergyman, he was born in a since-demolished property called Westgrove but often visited his aunt Eleanor, who had married a wealthy brewer, John Frazer Crichton, in Donnybrook House which still stands. This the Robinsons in their recollections describe as being ‘lowbuilt, old and charmingly planned, rooms open one into the other on the ground floor a bedroom opened off the dining room, the drawing room on the opposite side of the hall had its back drawing room and the same plan was repeated in the bedrooms upstairs.’ More than a century later, although the condition of the building has somewhat deteriorated, the layout remains unchanged. The origins of Donnybrook House are unclear. We know that by the mid-18th century the land on which it stands had come into the ownership of the Davies family as the Rev Boyle Davies, Dean of Cloyne died there in 1763. He was the son of another of those ambitious Anglican clerics so common to the era, in this case the Rev Rowland Davies whose father of the same name had come to Ireland from Herefordshire probably in the 1640s: Rowland Davies was born in Cork in 1649. He entered Trinity College Dublin in 1665 and initially seemed destined for a career in medicine before switching to the church. After taking orders in 1671 he held several minor offices and then became Dean of Cloyne in 1679. An ardent supporter of the Anglican faith (in 1716 he published a treatise called A truly Catholick and Old Religion, shewing that the Established Church in Ireland is more truly a member of the Catholick Church than the Church of Rome), he participated in the Battle of the Boyne, and the Sieges of both Limerick and Cork before returning to his pastoral duties. In 1707 he became Precentor of Cork and three years later Dean of the same diocese. He died in 1721. Rowland Davies may have been responsible for the purchase of Donnybrook’s land. On the other hand, he is known to have been a tenant of the Blarney estate, where two of his sons were born, until it was sold in 1702 to Lord Chief Justice Sir Richard Pyne for £3,000. It is said that the winged cherub heads seen above the arched ground floor windows of Donnybrook’s wings came from Blarney. Furthermore Rowland Davies built himself a house called Dawstown on part of what had formerly been McCarthy land north of Blarney. Here he died and here one branch of his descendants continued in occupation until the early 19th century. One wonders therefore whether the Donnybrook estate might have been bought by the Dean for his son, or whether Boyle Davies himself bought it. Curiously a year after the latter’s death his widow Mary, whose maiden name was Travers, leased the place to one Boyle Travers, who was a cousin of both her and her late husband (the reason for their shared first name is that they were both descendants of Elizabeth Boyle whose father Richard Boyle had become Archbishop of Tuam in 1638). The Davies/Travers/Boyle family synopsis above helps to explain why it is not easy to work out the origins of Donnybrook House. Douglas emerged as an urban settlement from the early 18th century onwards thanks to the development here of mills associated with the textile and weaving industries which produced linen sailcloth. Tellingly the first such to open was Donnybrook Mills in 1726 (it was also one of the very last to close in the 20th century). A large pond which stood in front of the house (it can be seen in the watercolour above which dates from the first half of the 19th century) is now dried out. However formerly it served as catchment for a millrace that twenty feet below drove the millwheel. The site on which Donnybrook House stands is therefore at the top of a slope, the ground dropping sharply to the immediate north of the building. A substantial basement beneath the main rooms could be the earliest part of the fabric, dating back to before the arrival of the Davieses; in other words, as was so often the case, a newer residence was created incorporating parts of an older one. It has been proposed that a McCarthy castle stood here, thereby establishing another link with Blarney. As one sees it today, the central block of the house, facing east, is of five bays and features a fine carved limestone doorcase with pretty fanlight above. The building initially looks single storey but this is not the case: a mid-18th century staircase directly beyond the front door leads to a first floor, the only evidence of which on the outside of the building is a solitary dormer window likely dating from the late 19th century and lighting the upper landing. The two slightly projecting tower ‘wings’ are believed to have been added in the early 1800s. They served both to increase accommodation and to give the house a more ancient, picturesque appearance (hence the gothic arched windows). As can be seen in that early watercolour, like the rest of the exterior the towers were originally rendered but subsequently covered in weather slates. Various additions were also made to the rear of the building over the course of two centuries, including a rather fine Edwardian bathroom that opens off the staircase return. Donnybrook House’s original setting has long since gone: the surrounding gardens no longer exist, nor do any mills that once operated in the vicinity. Likewise most of the other historic houses and villas once dotting the landscape in this part of the country are gone: today almost the entire area is given over to housing estates. As is apparent, the building at present needs some attention. The roof of the south tower (that to the left of the entrance) has collapsed, bringing down the floors inside and making this part of the building unsafe. Meanwhile the north tower is suffering from water ingress and risks becoming similarly hazardous. This damage is not visible from the exterior because blind gothic windows on the upper level were designed to conceal the pitched roofs. On the other hand, the central section of the property appears to be in relatively good condition although rather damp, and has continued to be used and occupied. Internally some of the original 18th and early 19th century wooden joinery, including wainscot panelling, has survived, as have a number of the old sash windows. The spirit of the house invoked by Lennox Robinson and his siblings can still be felt. Here is a building waiting to be rescued from what too often has been the fate of such properties in Ireland: ruin and disappearance. Wonderfully the present owner is keen to restore Donnybrook House and bring it back to residential use. Rescue and refurbishment is still feasible and must be encouraged. Donnybrook House is an important and rare testament to Cork’s architectural and industrial history. Its preservation merits everyone’s support. With special thanks to Ciara O’Flynn, Built Heritage Conservation Consultant/Buildings Archaeologist, for generously sharing her research into Donnybrook House. 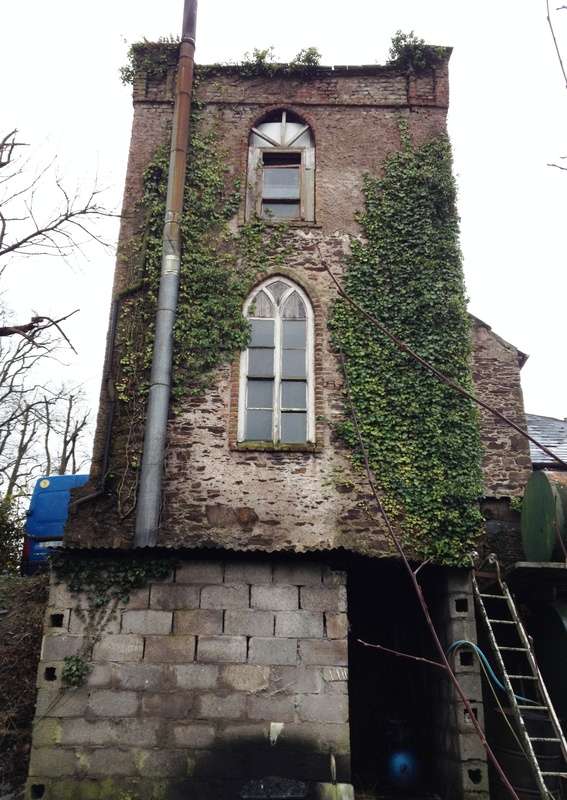 This entry was posted in Cork, Country House, Heritage at Risk, Historic Interior and tagged Architectural History, County Cork, Donnybrook, Georgian Architecture, Heritage at Risk, Historic Interiors, Irish Country House, Stately Home, The Big House. This was my maternal grandparents’ house – idyllic when I was a small child in late 1950’s/early 1960’s. We lived in Dean’s Oak, a house built by my parents on a plot carved from what was then Donnybrook House land. The decay looks terrible; I was in the house a few years ago and it didn’t appear too bad then but I was only in the central part. It would be really wonderful if my cousin does manage to restore it. As so many houses have been lost, maybe ‘crowdfunding’ might considered for raising some much needed cash in order that this building can be preserved? My mother Norma Carey (nee Crichton) said to me recently that my cousin Robert Crichton has made some progress with restoration.